Sometimes the need for blood outweighs all else. Barbarian-Princess Ivy will do anything to save her people, even if it means forming an unlikely alliance with Lukor the goliath. 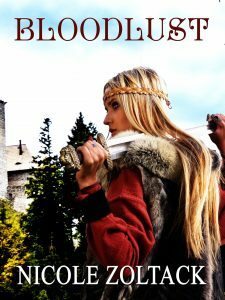 Bloodlust is driving her father to provoke the other five races into war, a war the precious few barbarians will not likely survive. Unbeknownst to her, Lukor blames the barbarians for murdering his sister and plans on sabotaging her goal. Almost despite themselves, they grow to respect each other, but nothing Ivy can do will prevent the war. Not even killing her father and becoming Barbaroness can stop the tide. And when bloodlust claims Ivy, forcing her to kill everyone in her path, she might destroy her one last chance at peace and possibly love too with one swing of her sword.